For many American college students, their first serious encounter with the theory of evolution may come as part of an introductory biology course. As surprising as this might sound, the unfortunate reality is that in many high schools across the country, studies indicate that evolution is often either avoided or covered superficially as part of a crammed science curriculum, taught by teachers who are under-qualified and poorly supported. The lack of prior familiarity with evolution presents a particular challenge to religious students who are likely to have questions about how to reconcile what they are learning in the college classroom with their own faith. Surveys indicate that more than half of all students enrolled in introductory biology courses believe in God and consider themselves religious. If their questions about science and faith go unaddressed as part of their coursework, research suggests that learning is likely to be inhibited. Yet, unfortunately most faculty members in the life sciences are not prepared to adequately address the questions that religious students hold about the connections between science and faith. Surveys of instructors indicate that the great majority of life science faculty are nonreligious, and that many equate religious belief with fundamentalism, assuming that faith by definition is in conflict with science. Moreover, when asked, most do not see religion as a topic appropriate for a science course. Even those instructors who want to facilitate more thoughtful classroom conversations about science and religion often lack the confidence and training to do so effectively, and they therefore avoid the topic. For these reasons, in recent years, researchers have begun to test approaches embedded in introductory biology courses for facilitating more constructive conversations about science and religion that promote increased student understanding evolution. The studies point to promising models for instructors to adopt and offer insight on strategies for encouraging more constructive public dialogue about science and religion more generally. In this article, I explore several of the relevant studies and lines of research in more detail. Even though a religious student may successfully complete exams and assignments that test their knowledge of evolutionary science, their scores may not reflect a deeper acceptance of what they learned. These students, write Elizabeth Barnes and Sarah Brownell of Arizona State University, may leave a course still doubting whether evolution is the best (and only) scientific explanation for the diversity of life on Earth. Because of their experience in introductory biology courses, many religious students may also be turned off from pursuing a career in science. Research indicates that students are more likely to choose a science career if they feel a sense of belonging as part of their coursework. 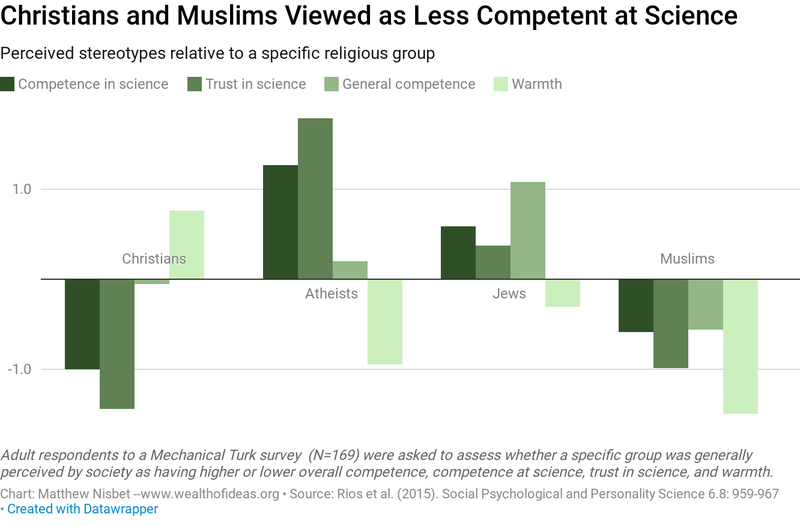 Yet for religious students, research led by Ohio University’s Kimberly Rios suggests that strong prevailing cultural cues tell students that science and religion are in conflict and that Christians and Muslims lack competence or ability in science (see figure). Research also suggests that these false stereotypes, which are sometimes voiced by their instructors and peers, can harm the performance of religious students on science exams, further eroding their interest in science. Student uncertainty about evolution may also be caused by a lack of awareness of church teaching or doctrine on the matter. Most major religious traditions, including the Roman Catholic church, the Mormon church, and mainline Protestant churches, have either a neutral or explicitly affirmative stance on evolution, acknowledging the consistency with church doctrine. To investigate this possibility, Arizona State’s Barnes and Brownell studied the experiences of ninety-five students enrolled in an introductory biology course that featured a specially designed two-week module focused on science, evolution, and religion. In addition to chapters from their textbook on natural selection and speciation, students were also required to read Science, Evolution, and Creationism, a booklet published by the U.S. National Academy of Sciences. The National Academy booklet was intended for use by scientists, teachers, parents, and school board members who wanted to engage in more constructive conversations with others who remain uncertain about evolution and its place in the public school curriculum. To guide their efforts, the National Academy commissioned focus groups and a national survey to gauge the public’s understanding of the processes, nature, and limits of science. The authoring committee, as project directors Jay Labov and Barbara Kline Pope explained in a subsequent article, also wanted to test various frames of reference that explained why alternatives to evolution were inappropriate for science class. The committee had expected that a convincing storyline for the public would be a traditional emphasis on past legal decisions and the doctrine of church-state separation. Yet the data revealed that audiences were not persuaded by this framing of the issue. 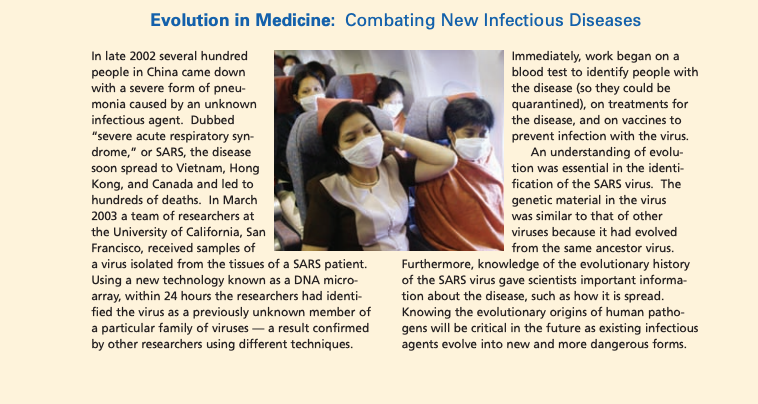 The National Academies booklet defined evolutionary science in terms of protecting public health. Instead, somewhat surprisingly, the research pointed to the effectiveness of defining evolutionary science in terms of social progress, explaining its role as a building block for advances in medicine and agriculture. The research also underscored the effectiveness of reassuring the public that evolution and religious faith can be fully compatible. 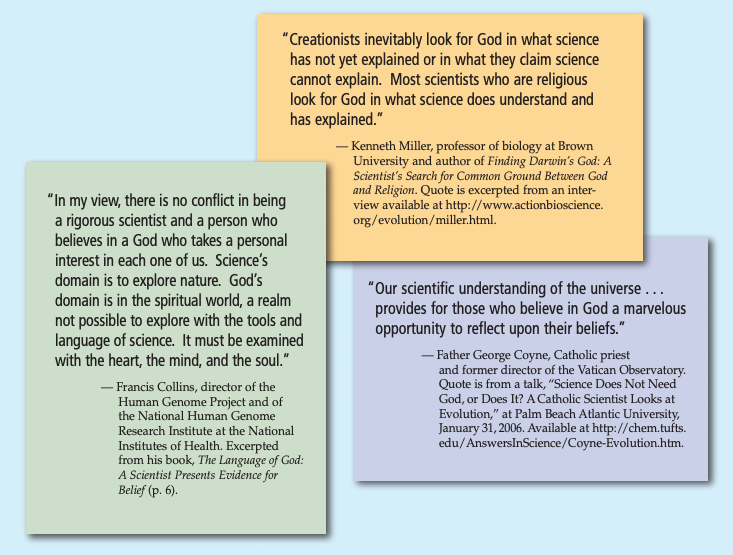 The National Academies booklet emphasized statements from prominent religious scientists. To evaluate the impact of the module, surveys were administered to the class before and after the module was completed. In contrast to the more than 50 percent of students at the start of the module who said they perceived religion and evolution as in conflict, only 26 percent said the same at the end, indicating that the module had reduced by nearly half the number of students holding a “conflict” outlook. More specifically, eleven out of the thirty-two students who said they perceived conflict at the start of the course shifted their outlook. Among those who were unsure at the start, eight out of fifteen indicated that evolution and religion were compatible after completing the module. Interestingly, there was no observable change in student scores on measures of religiosity. Knowing that often college instructors are pressed for time, in a follow up study involving interviews with a new group of students, the Arizona State team found that even classroom use of a 6 minute module emphasizing the compatibility of science and religion could potentially be effective. Eight of the 10 religious students who were taught by way of the module reported afterwards that the short experience had eased their concerns about the perceived conflict between evolution and religion. In a related line of research conducted at Brigham Young University, researchers focused specifically on how Mormon students — if informed of the Mormon church’s official neutral position on evolution — may be more likely to subsequently accept evolutionary theory. In this case, the Mormon Church maintains strict belief in God as the creator, but in its statements it does not confirm or deny the potential for theistic evolution, leaving room for Mormons to adopt a scientific interpretation. The experiment involved more than 1,500 non-majors enrolled in introductory biology courses. In the test condition, as part of the semester, students participated in at least one lecture and discussion of a “BYU Evolution Packet” that discussed the official Mormon church stance on human origins. After reading the packet, during the class discussion, students were encouraged to ask questions and make comments. The control condition had access to the BYU Evolution Packet, but no time was spent as part of the course in discussing the packet. For both the experimental and control conditions, overall student acceptance of evolution increased across the semester, and this greater level of acceptance remained five to seven months after completion of the course. But in the experimental condition that included the lecture on official Mormon teachings, gains in acceptance of evolution were significantly higher than in the control condition. As the researchers note, at the outset of the course, those students who held more misconceptions about the Mormon church’s stance on evolution were some of the least likely to accept the theory of evolution. Their analysis indicates that the booklet and single lecture on the topic corrected many of these misconceptions among the participating students, which in turn led to the higher gains in student acceptance of evolution in comparison to the control condition. For most college students, the introductory courses they take during their first few college years may be the only thoughtful discussions of science and religion that they can draw on for the rest of their adult lives. If these students leave a science course lacking a strong motivation for further information on the topic, they can easily avoid the many available popular science books, articles, and films. When they do incidentally come across coverage in the news media, evolution is most likely to be framed in terms of controversy and irreconcilable conflict with religion. We tend to think about general science education at the college level as a vehicle for imparting knowledge about the physical world, particularly in terms of basic science literacy. But general education science courses should also serve a core civic purpose, imparting critical understanding of the complex relationship between science and society, modeling for students’ thoughtful ways to negotiate differences. The first few studies formally evaluating approaches to discussing evolution and religion are models to build on. More research is needed to expand the evidence-base specific to evolution and to evaluate approaches for effectively discussing other challenging topics such as climate change.